Brutal conflict spreads across the wilds of western Immoren, fought by savage warriors and terrible beasts. Powerful warlords orchestrate grand strategies and daring battlefield tactics, their actions bringing glorious victory - or the despair of final defeat. Do you have the courage and cunning to guide your forces to ultimate triumph? Take command of the mightiest warriors and beasts to conquer the wilds of Immoren! HORDES High Command is a deck-building game for 2-4 players set in the foreboding wilds of western Immoren. 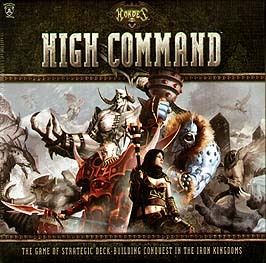 This stand-alone game can be played with just the contents of this box or combined with other HORDES High Command products for a customizable experience. Leverage your resources, gather your armies, and dominate your foes to stake claim to the wilds of western Immoren!